These 68% polyester, 29% viscose, and 3% elastin pants are by Joie and were made in the USA. They have a black and offwhite thread pattern with two separate vertical solid black lines, alternating with a vertical broken offwhite line, which gives it the appearance of a multi-tone gray background. 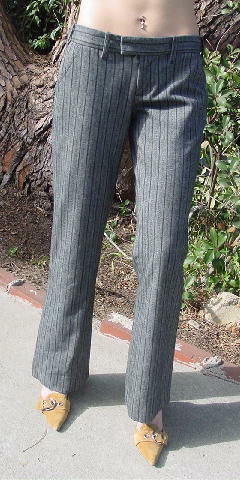 There is a 1 1/2" wide waistband, belt loops, and a large two hook waistband closure with one interior button. They have a 3 1/4" long zipper fly. 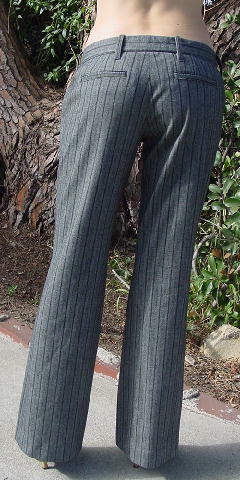 The front has two diagonal upper pockets and the back has two faux pockets. waist to hem 40 3/8"